Do you ever feel overwhelmed by the number of decisions you have to make? I’m not talking just about major decisions – should I take the job offer? Can I build my own business? Is it time for me to ask for a raise? We have major career and personal decisions to make from time to time–that’s life. But what about smaller decisions? Things like, what time should I leave for that appointment? What outfit should I wear today? What are we having for dinner? Timely piece of advice there. These decisions may seem unimportant in light of major life decisions. And for many, you may envy the flexibility my season of life affords me. But to be honest, sometimes these decisions drain me. They require mental energy and accountability to myself, which can be tiring. That is why we should be attentive to the number of decisions we have to routinely make. Think of it this way. You can have a major leak in a pipe, or a number of smaller leaks in areas that may be losing connection. Either way, it’s still draining resources. You might be able to last longer with the smaller leaks, but they are still going to affect you. It’s the same with small decisions. Any exercise of our decision making “muscles” will tire us. It’s not that we don’t use them, and with use, they become stronger. 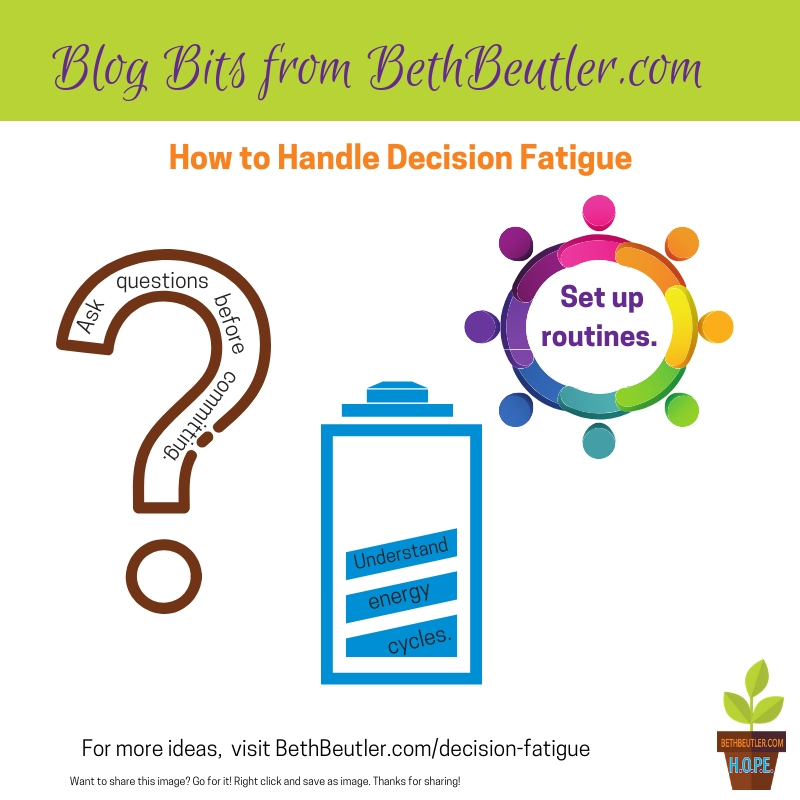 But if we have to make too many decisions at a time, we can suffer from decision fatigue. Understand your energy cycles, and make important decisions when you aren’t under stress or exhausted. If you have flexibility as to where you work, pay attention to the environments that stimulate your productivity, and don’t feel like you have to try every new place that comes along. (Speaking to myself here!) Choose to work regularly in the environments that inspire you most. Ask questions before you make a commitment. Why do I want to take this class? Is now the best time? How many nights out a week energize me vs. exhaust me? We will always have decisions to make. But if you can streamline your decision-making processes, you might be able to reserve the energy and focus you’ll need for the larger decisions of life and work.